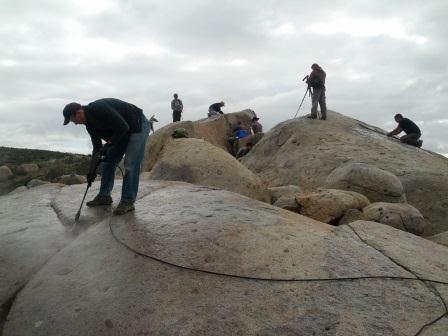 February 10th, nearly 100 climbers descended on the Santee boulder field in East County San Diego for a major paint removal. I had managed to pull together help from Mesa Rim Climbing and Fitness Center, the Allied Climbers of San Diego, the University of San Diego, the city of Santee, and most importantly scores of community volunteers to eradicate as much graffiti as possible in a single day. Thanks EVERYONE who helped in this monumental community event. It was by far the most impressive volunteerism that I've ever seen in the San Diego climbing community.